This is something I seem to see parents worrying about sooo often... Parents of four and five year olds (both in and out of school) wring their hands and tear their hair out over the fact their children can't read. When I see this, I just shake my head, and feel bad for those poor kids! There is such an industry built up around teaching kids how to read. So many programs, flash cards, DVD's, computer programs... I can't help but think that an awful lot of money must be wasted annually on something that really doesn't need any "teaching" at all, something that children will learn simply by spending time with literate adults. I suppose my own family bought into this at first, as well. When I was first pulled out of kindergarten (my only experience with traditional schooling), my mother bought a program called Sing, Spell, Read and Write, and, though my memories of that are pretty foggy, I know I did it for a while, and managed to sound out words, but never finished the program. I don't remember ever being *forced* to do it (and my mothers memories match up with mine), no tears were ever shed over it, and it was simply forgotten about. Now, I should point out at this point that my family is VERY big on reading. Bookshelves line every free wall in our house, filled with everything from sci-fi and fantasy novels, to cookbooks, to locomotive repair books, to encyclopedias, to natural health books, and a thousand other things. From the time I was tiny, the people around me, my parents, were regular readers. And from the time I was tiny, they read aloud to me. Poetry, the newspaper, picture books, you name it. Words were something I appreciated from a young age. But I had no interest in reading myself for several years. I don't remember precisely what age I was when I started to read, although I do remember feeling embarrassed in Brownies when I couldn't read. I also remember (or at least I think I remember-as I said before, a lot of these memories are rather cloudy) my mother calmly assuring some other mothers that I would read when I was ready to. And, sure enough, she was right! When I was something like age eight or nine, my mother was reading the first Harry Potter book aloud to my sister and I. But, well, she had things to do other than read, and if she read too long, her voice would get hoarse. So, being quite frustrated at how slow a process this was, and really wanting to know what happened next, I picked it up and began to read. After that first Harry Potter book, I became a truly voracious reader. I went through countless novels, often two or three of them in the same day, just soaking up all the stories, characters, places. I truly fell in love with fiction. I also simply loved poetry, and memorized several fairly long poems in their entirety (most notably The Highwayman by Alfred Noyes. After seeing the movie Anne of Green Gables, where part of that poem was recited, I just fell in love with it). As for writing, well, since before I could read I'd been dictating simple poems for my mother to transcribe. And after I learned to read, I simply wrote more poems myself! I do remember playing spelling games with my sister, where my mother would say a word and both of us would try and spell it properly. This was always great fun to me! So now, years later, I just get so frustrated when I see parents worrying and fussing over when their children will learn to read. So many teens, so many adults for that matter, hate reading. I firmly believe this is because it was forced. Things aren't fun when you *have* to do them. Reading, and writing, come so naturally, so organically, if only you're brave enough to take a deep breath, and let things unfold. I can see so many ways that things could have gone wrong, had reading or writing been made into Schoolwork (I know so many homeschooling families who make their children write a book report when they finish a book... Who would want to read a novel when you have that tedium waiting at the end of it?? ), that I'm forever grateful to my parents for fostering such a great love of words in both me and my sister. We love reading and writing precisely because those things have never been anything but joyful, even when it was hard (sometimes I have to push myself to write something I want to get written, but it's always worth it), because something you do entirely because you want to do it is inherently joyful. So, I want to say to all those parents of younger kids, that you really, truly, don't need to worry about reading and writing. Read to your kids, enjoy reading yourself, and the rest will come! Your kids may or may not develop a passion for language, as that depends in large part on personality, as well, but I can't help but feel that they're so much more likely to come to love words, love the beauty of language, if they approach it in freedom! I believe it's natural and teaching it causes roadblocks. Thank you, so helpful to hear. I get nervous and pressured and I want to be able to stay the course! Thank you, thank you! I totally agree. I follow my children's leading when it comes to learning to read and write. As they show an interest in it, I make the most of it, but I don't force it. Thanks for this, Idzie! My two daughters learned the same way. And now, they're in their 30s, reading everything in sight, and writing novels, government funding proposals, blogs, poetry, business reports, and more. When a person is motivated to learn something, the learning will, in most cases, happen easily. However, the unfortunate regimentation of schools and the industry that supports it cause most people to believe that reading, writing, and math are difficult. I love learning about how people learn naturally, so this post is a keeper! Sadly, my brother was a 'late reader' in school terms and was always behind and made to feel dumb. Now, he barely reads and writes :( Damn school. I SO wish he had the same kind of opportunity to learn as you did. My husband likely would've been a naturally later reader. He read what he was forced to read in school, and then stopped as soon as he graduated. He's now 25, and has JUST started to read for pleasure for the first time in his life. If he likes a book, he devours it. If he doesn't he's learned that he already has 'permission' to drop it. Our kids can both read, at age 7. My son loves to read on his own. My stepson is one of the 'best' readers in his gr 1 class (yes, they're still in school... until I get a few things sorted out, financially), but he doesn't like to read. However, he loves to be read to, so we do lots of that instead. One day, if it's right for him, he'll fall in love with books, just as his dad did. i have yet to comment here on your brilliant blog --just now-- i had to. your post today spoke to me as if we were sitting in my living room face to face and you KNEW how much i needed the reassurance of a young woman JUST LIKE your wonderful self. thank you, thank you, thank you for your inspired words! great post! It's nice to read another story of someone learning how to read, write & so on in an organic manner. Love this Idzie...and am sharing it if you don't mind. You are just one of my favorite writers and I'm so happy that you take the time to put your thoughts out there for others to read. What a wonderful post, Idzie. My daughters learned to read and write in somewhat the same way---organically. They learned to write by reading good writing. All things in their own time. A wonderful post Idzie. Thank you for writing it. I'm so glad to have found your blog and this post. It was just what the unschooling mother of a 7-year-old who loves to be read to but doesn't really want to read on his own yet needed to hear right now--a bucking-up of my own intuition and heart. Cheers to you! @Stephanie: Thank you! :-) And I totally agree. Teaching causes roadblocks in reading, it doesn't make it better! @Hollie: Thanks! :-) Aw, family can definitely be difficult... I remember feeling really judged by certain extended family members while growing up... Best of luck with yours! Thanks for sharing Idzie. I also just blogged about how my three daughters learned to read, all in different ways. To mys surprise, one of them was reading 'out of the blue' before she was five! I totally agree that parents freak out way too much about how fast their children learn to read and write. When my Mom decided to homeschool me, some our family members feared that I would never learn how to read, and tried to talk me into going to school. But by the time I was 3 or 4 I already knew all of the letters and most of their sounds by watching pre school shows like Seseme street. So when my Mom showed me how to put the sounds together and read words, it wasn't much of a struggle. I also had a learn to read computer game called "Reader Rabit" that I played frequently. From there, I began reading books when I was about 7 or 8. So I actually learned to read pretty easily without ever setting foot in a traditional school. Great post...very encouraging for homeschooling parents. Thank you for sharing your experience. Very well put Idzie! We're unschoolers and our oldest son just started reading. Your words are wonderfully reassurring that we're doing things the right way. I'm very glad to have found your blog! I would never learn how to read, and tried to talk me into going to school. But by the time I was 3 or 4 I already knew all of the letters and most of their sounds by watching pre school shows like Seseme street. So when my Mom showed me how to put the sounds together and read words, it wasn't much of a struggle. I was linked to this through a psychology article that has been circulating through my homeschooling/unschooling group, and it is pretty much exactly what I have never been able to find the words to say about reading. My parents always read to me, they are both incredibly literature-oriented and wanted to pass on their love of reading to their children (at which they have been partially successful, as their oldest and youngest at least are voracious readers). My mother was reading full length young adult novels to me by the time I was four. We made our way through the Little House on the Prairie series before I reached kindergarten...at which point reading was thoroughly ruined for me for a short time. From my fuzzy memories I believe I went into school knowing how to read at least partially, but school destroyed my love for it. I loved to be read to, but I did not want to read, especially because the things that were 'appropriate' for my age group were far below the reading level that I quickly developed. My passion for reading had to be resurrected for me, and this was managed successfully simply because I reached a point where I could no longer stand my mother taking breaks from reading to me to pay attention to my sisters and I eventually just took the books away from her and read to myself. From then on my love of reading was carefully nurtured by an assortment of lovely people that kept school from ruining it again for the remainder of the time I was stuck in the system before being pulled out to Unschool. But I've seen so many kids who never had that, reading was forced on them through repetitive and boring books and teachers who had no time to make it joyful and they never reached a point where they learned to love it. It bothers me so much to know that something that brings me so much joy has been so thoroughly ruined for so many others. Love it!! Yes! Hope you will come visit my blog on vacation schooling at http://vacationschooling.blogspot.com/. Love the Blog, I myself came to read by myself all of a sudden without being pushed, so i hope this blog will be noticed and taken into account. My own kids are still pretty young, and while I'm confident in our decision to unschool and let them learn at their own paces ... it's always reassuring to see something like this from a grown unschooler. Thanks. Great post! My 5yr old has been writing letters since she was a little over two. It wasn't forced, it was something she was interested in. Now she's interested in upper and lower case letters, writing numbers. Both of my girls love to talk about the letters on signs we see when we're out, or what they see on TV. It's so nice not stressing over how they stack up to other kids their age. I really do love this unschooled life! I am so glad I found your blog. It's great to read the words of a unschooled teen. I loved this post. My 10 year old homeschooled daughter can read, she just doesn't like it. As a voracious reader this goes against everything that I am. I can not imagine my life without books. But..I do not push her, I just keep making sure she is surrounded by amazing books and hoping. That's all well and good so long as your child does NOT have a learning disability like dyslexia. In that case, it's good to start therapy at a younger age. But I know that in the "la-la" world of unschooling everyone clings to the belief that children always do everything okay. Sadly, sometimes kids need extra help, and it you just sit around waiting, you can miss a golden window of opportunity. I think this whole late-reading worship is hurting some kids who really do fall behind when their parents think some utopic ideal of child-led learning has to be met instead of thinking more critically about late reading. and whether or not their child is displaying the skills upon which reading is built. Also, keep in mind that your story, no matter how sweet, is not "proof.". These are things called anecdotes (or a plural of anecdotes if you say "I know several kids who also read late and are doing fine."). Just because you did okay at a later age does not necessarily mean most kids will. Yes, Idzie! Having relaxed some time ago my perception of age standards with regard to the whens and hows of learning, I actually anticipated that my son would learn to read as his teen years approached. His interests lied elsewhere- not in 'learning to read'. And these interests are exactly what propelled him to decode reading all on his own (and fairly secretly- I might add). He learned to read because his love of increasingly complex video games was making it difficult for him to play without a reader by his side. At 6 1/2 years old, he could suddenly read almost anything in sight. Now, at a little over 7, he thoroughly enjoys his ability to read anything and everything that crosses his path to anyone who will listen. It's really a beautiful thing to watch and a testament to the fact that a supported individual who needs/wants to know something will have the capacity and motivation to take it on in their own time and with whatever support they request or need to help them to achieve their goals. My daughter now has expressed a desire (at 5) to learn to read and is requesting assistance from her parents and brother- a different style for a different child. Forcing any type of teaching situation without interest on the part of the child is the quickest way to frustration for everyone and self-consciousness/self-loathing on the part of the child when, because there is no interest/foundation (see Learning Theory), their lack of readiness is perceived as a problem with the child. The problem is in a standard set by an institutional system that is ill-situated to accomodate a child who cannot churn out reading and assignments on a mill schedule. I read an article just the other week saying that there are some schools who have started to test children on application to enrolled in PreSchool to see if they can read/write. Preference given to those who can. WTFrog? There is far too much pressure put on our mites today. I agree with Pele....Be smart just don't assume… help your child. It is not fair to put your Childs learning experience solely on his or her self. It is a privilege to be taught and children especially respect leaders and teachers as well as adults. If you wanted to take a sewing class and showed up for class you would be disappointed if someone told you oh just try it yourself and when you get good at it is the time you were meant to get good at it! No you would want to be shown how to do it right. You would not send your child down the street and hope they learn how to cross the street, you would guide them. There is a difference in guiding children and pressuring them. Waiting for them to learn on their own is not guiding them and everyone needs guidance children and adults. If we did not need some type of guidance we would not have manuals or recipes. When you purchase new items or equipment for your home or car or anything it comes with manuals because someone is trying to guide you in successfully using the product not blindly leave you stumbling for hours if not months trying to put it together we should treat our children the same. My ten year old is very good at reading from teaching him when he started school at four. Out of panic I taught him at home to 'catch up' so he would feel left or behind but then in a matter of months became two years ahead of his reading age by the end of that academic year. When I finally recognised the school didn't teach but would take credit of what he knew I decided to home educate. He reads the dictionary and encyclopedia alot. As he won't pick any fiction himself yet enjoys the ones I have him read to me regularly - even if it's only a couple of pages at a time to make sure it doesn't feel like a boring chore. The schools here (UK) do not have time to find out what each child enjoys or encourage the joy of reading. Reading, and writing, come so naturally, so organically, if only you're brave enough to take a deep breath, and let things unfold. I agree. That is what I'm doing right now after created a blog. I make my fingers move with the keypad any idea that comes in my mind and deep within me. I want to make it a hobby though. Grammar is poor but I tried and surely I will learned. Its my pleasure arriving this blog. Thanks heaps Idzie! Your words further strengthen my belief that reading should come naturally. I was worried about my son at some point but realised that it wasn't doing any of us any good and so learned to chill. I can't remember when I first learned to actually read. Even if I could sound out words and diagram sentences, really reading as in actually comprehending and visualizing stories, wasn't something that I was capable of until I was around nine years old. At the time I was enrolled in a Catholic school. I had very few friends and found class tedious and stressful. Once a week the teacher would lead us down the hall in a single file line to the schools library. I'd check out as many books as I could. Sometimes more if the kind old snowy haired librarian lost count. I hid thin American Girl paper backs behind my textbooks and spent recess with Sideways Stories from Wayside School and Bunnicula. After reading everything in the school library I began asking my parents for rides to the public library. There was always a stack of books on my desk. Books were there for me when education failed.I learned about the French resistance, Enigma, Labor movements, Feminism, Neurology, Dinosaurs, the American Civil War, Greek Mythology and Queen Elizabeth I instead of doing my homework. Idzie, thank you for sharing your story! My own four children (including my dyslexic one) learned to read by being read to. It works! I'd like to invite you to add the link to this post to the "Learning to Read" blog hop, a collection of stories about how unschooled and homeschooled children learned to read. I hope you don't mind but I printed this article and gave it to my 9 year old daughter who struggles with reading. Before she exited school 2 years ago she had a school psychologist tell her she was ADD and Learning Disabled and Probably Dyslexic (and put this all on her heart at age 7!) She couldn't even recognize the word "of". Now she is 9, reading with help,and more confident but sometimes her confidence wonders off when she remembers what she's been told in the past by "educators with degrees". I am thankful to have read this. It will help build her confidence. 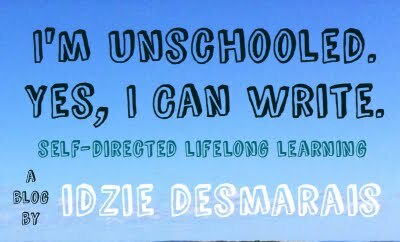 I was 'unschooling' up until this past school year. I am now regretting my decision as my 9yo is now being labeled as learning disabled or cognitively impaired because he can't read well, write well, or spell well. I don't think he is at all, just a late learner. My oldest son (age10), taught himself how to read. I tried to teach him how to read, but it felt so futile that I gave up. Now he reads books all the time by himself. I still don't think he has confidence in his abilities, but he's always been like that. He'd have to be bribed with M&M's just to tell me the colors of them. Otherwise, he'd only answer with "I don't know". I have a wide range of readers and learners. My almost 8yo taught himself how to read at age 2, and while he was "placed" in 2nd grade he probably should be in 4th grade. He's an excellent speller, avid mathematician, and LOVES to read. He taught himself how to write, spell, and do math, and he's above average. I want to pull them out of school (I have 9 kids 5 of whom are in public school currently), but they all whine and say that they want to go to school. I think they are loving the social aspects of school for the moment rather than the academic pressures they don't see. Like the frustrating 2nd grade teacher who keeps trying to change my 8yo's way of writing numbers, or the kindergarten teacher who keeps telling my 5yo to "stay inside the lines". I disagree with this post, although it saddens me to admit it. I was like you as a child, and I learned to read seemingly effortlessly and naturally, but my son's experience has been the completely opposite -- because he has learning disabilities, and I didn't. We have a houseful of books and spent hours reading aloud to him, but he is one of the subset of children who can't learn to read via an organic whole-language approach, and like most dyslexics/dysgraphics he needs language instruction to be "explicit, direct, cumulative, intensive, and focused on structure." This has been very difficult, and not just because it is contrary to our family philosophy. Early intervention is key, so I really wanted to point out that your optimistic advice to parents to not worry could be unintentionally harmful. If your gut tells you something is wrong with your child, take those parental instincts seriously. I would agree with this. My daughter learned to read almost exactly as the above story describes at age 8. She reads A LOT, and since she has such a strong visual memory, plus good auditory skills, her writing/spelling is also developing organically. However, this is not the case for my son. I feel it would be an absolute crime if I just sat back and hoped he could read and write by 16. I support him, I encourage, I search out books that might inspire him. I continue to read to him daily. I take him to the library and so forth, but I also help him with the skills he lacks (visual/Auditory memory skills)with short, structured 'lessons'. He enjoys it, I make it fun. You cannot leave a kid to flounder and just 'wait', as by then they may have very poor self-esteem and have decided that academic life is not meant for them. I am 100% child led home educator, but that doesn't mean doing nothing. It actually means supporting your child in whatever way they need, seeing them as an individual. A dyslexic child needs support. My kids don't really enjoy being read to on a regular basis, which concerns me a little for those not yet reading on their own. Do you have any thoughts on this? I've just come across your blog, and I want to thank you for this post. We are at the start of our home education journey with our children - the eldest is 3.5 years - and I was starting to get a bit worried about how I will teach them to read. You've taken a load off my mind. Thank you. I'm the Mom of a 9 yr old who has been diagnosed severely dyslexic. We have tried Waldorf (horrible experience), Aneleise (GREAT school, but, my son wasn't reading), and now he's in a school that is teaching him to read via the Linda-mood Bell method. BUT, he just HATES school. He is SUPER athletic and social, and loves to be DOING things all the time. He is a lot like me, and i hated school until i went to a continuation school in High school. I loved that school so much. There is a school her in OC California called the OPEN SCHOOL that I am looking into. Problem is, I would need financial help in order to put him there, and my family is very academic. HELP? Thank you for this post. I'm unschooling my 6 year old, he's already taught himself so very much on his own, but just recently I stated questioning our family learning style and thinking that I needed to be giving formal lessons. Using an online learning-to-read website I quickly realized it was nothing more than flash cards and just didn't feel right based on the reading I've done on child development and education. I then started to panic thinking that I just didn't know how to teach! This post is the exact reminder that I needed to set me back on track. Now to pull out a book for some more reading time with my littles! Emi's new blog, and changes to this blog!